Part 1 Dairy product safety and quality: The major constituents of milk; Influences on raw milk quality; Good hygienic practice in milk processing; Improvements in the pasteurisation and sterilisation of milk; Modelling the effectiveness of pasteurisation; Flavour generation in dairy products; Controlling the texture of fermented dairy products: The case of yoghurt; Factors affecting the shelf-life of milk and milk products; Testing the authenticity of milk and milk products; Functional dairy products; Developing and approving health claims for functional dairy products. Part 2 New technologies to improve quality: On-line measurement of product quality in dairy processing; Rapid on-line analysis to ensure the safety of milk; High-pressure processing to improve dairy product quality; Optimising product quality and process control for powdered dairy products; Separation technologies to produce dairy ingredients; The use of dissolved carbon dioxide to extend the shelf-life of dairy products. Part 3 Cheese manufacture: Acceleration of cheese ripening; Non-starter lactic acid bacteria (NSLAB) and cheese quality; The production of smear cheeses; Flavour formation in cheese. Part 4 Appendix: Improving the nutritional quality of milk. The dairy sector continues to be at the forefront of innovation in food processing. 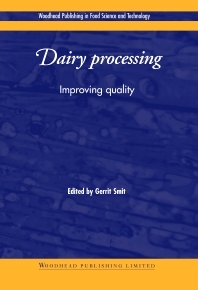 With its distinguished editor and international team of contributors, Dairy processing: improving quality reviews key developments and their impact on product safety and quality. The first two chapters of part one provide a foundation for the rest of the book, summarising the latest research on the constituents of milk and reviewing how agricultural practice influences the quality of raw milk. This is followed by three chapters on key aspects of safety: good hygienic practice, improvements in pasteurisation and sterilisation, and the use of modelling to assess the effectiveness of pasteurisation. A final sequence of chapters in part one discuss aspects of product quality, from flavour, texture, shelf-life and authenticity to the increasingly important area of functional dairy products. Part two reviews some of the major technological advances in the sector. The first two chapters discuss developments in on-line control of process efficiency and product quality. They are followed by chapters on new technologies to improve qualities such as shelf-life, including high pressure processing, drying and the production of powdered dairy products, and the use of dissolved carbon dioxide to extend the shelf-life of milk. Part three looks in more detail at key advances in cheese manufacture. Dairy processing: improving quality is a standard reference for the dairy industry in improving process efficiency and product quality. Professor Gerrit Smit is Manager of the Flavour, Nutrition and Ingredients Department at NIZO Food Research, one of Europe's leading centres for dairy research.